That wasn’t what Coachella attendees came to hear. You can sense a boo brewing in the air; if nothing else, there’s a palpable wtf washing over the crowd. 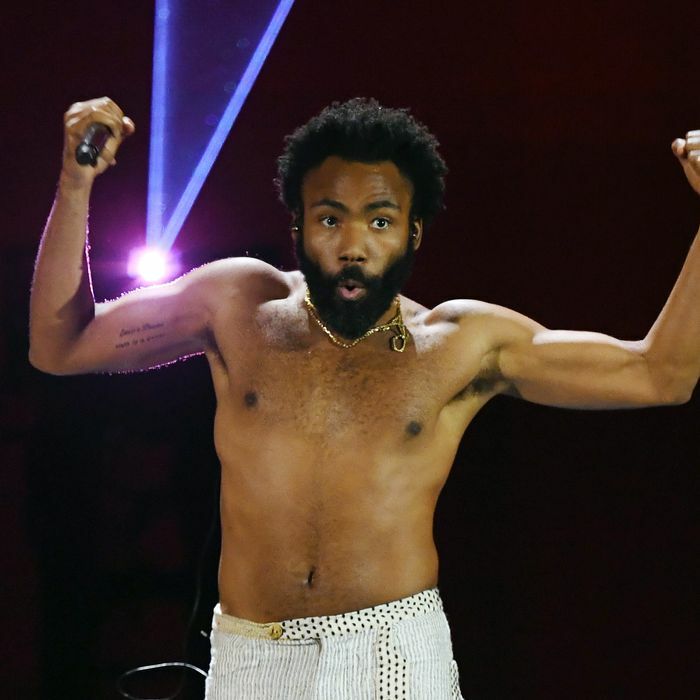 That buzzkill subsides fast, but there’s no forgetting what just happened: 35-year-old Donald Glover used the opening night of this weekend where so much will be overproduced to remind these revellers that they’re not in control, that they don’t have all the time they think, that death has no mercy and that life is precious. He instructs that phones are unnecessary. He wants church, he’s brought a choir dressed in religious garb, he’s channeling spiritual healing. The experience over the course of his set is entertaining as hell, but it’s also intense, unsettling, and makes you ask questions of yourself. Glover came to hold a mirror up – not to the enemy or the overlords, but to each and every one of us. The mirror isn’t always so abrasive. Sometimes it’s hysterical. Before he comes onstage, a video montage runs from earlier in the day of festivalgoers outside a hangar where his new movie with Rihanna, Guava Island, was screening. They were asked what they thought of Glover’s headline slot. Some were positive. Many weren’t. “I don’t really vibe with him,” said one. “It would be good if he brought someone out,” said another. The crowd laughs. (By the way, the only person Glover does bring out is Ludwig Göransson, his long-term producer, who just won an Oscar for the Black Panther score – he plays a brief, shredding guitar solo). During the set, Glover walks into the crowd with a joint, offering one audience member the chance to get high with him. “How old are you?” he says to one man. “Let me see this ID.” He conducts his unparalleled band from the center of the crowd while this lucky customer attempts to stomach Gambino’s entire spliff. He looks as blazed as your first time; Gambino looks as cool as a cucumber.